I wrote about it before. The angle of the sun is changing. Spring is here. This morning the sun is shining through a crystal hanging outside. A ray of light flew through our French windows. 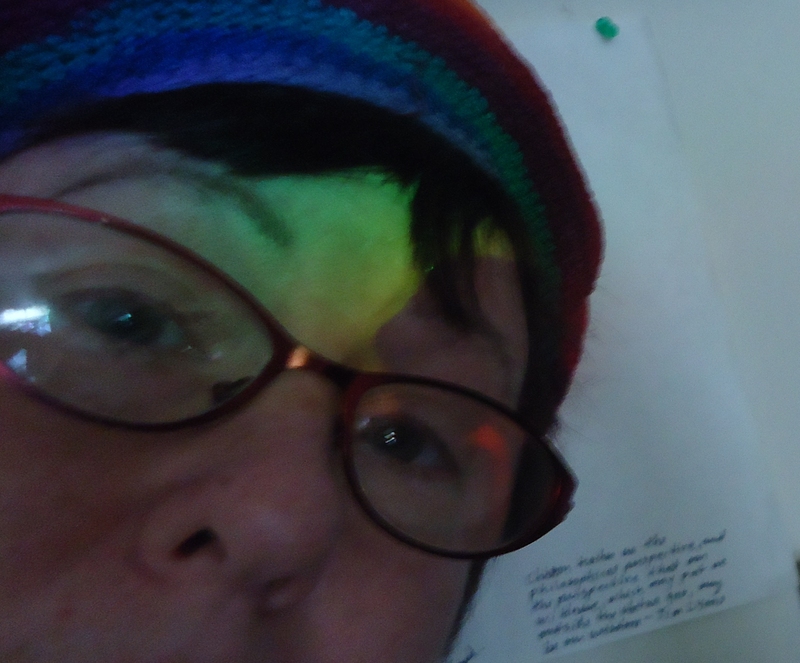 Today I took a self-photo and captured this rainbow from outside on to me inside my home. I caught it shining on my forehead or brow. I am expressing a part of me from the inside out also. How I see the world. I love capturing the essence of flowers by painting watercolors, or I like to capture nature by writing poems. It is the beauty I see all around me that takes me to my knees, so to speak. Everything we do starts on the inside and works its way out. This entry was posted in "In the beginning there was a void except for the written word." The Avengers (Band) and tagged Alternative music, Art, » Weekly Photo Challenge:, beauty, French windows, spirituality, Subculture. Bookmark the permalink.